Last week I found this image on imgur. 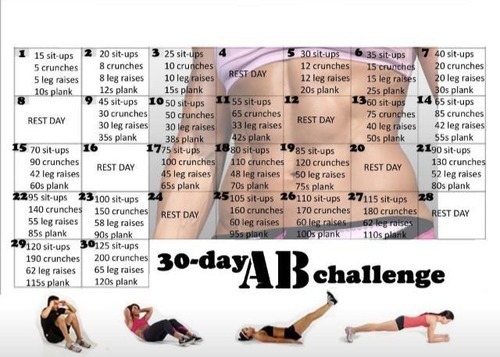 30-day AB challenge. I thought it sounded interesting – I needed to get some work in on my core muscles and I can definitely do something for 30 days. (Well, as long as it does not include jumping jacks. My knees did not enjoy Jillian Michaels’ 30 day shred.) Currently I’m on day 8 – rest day – and I have to say that the first week have gone surprisingly well. The second day was hell. It turns out that I am really much more untrained in my core than I thought I was. But the rest have gone okay so far. Going from 35 sit-ups to 40 was a bit of stretch, though. It will be interesting to see how 45 will feel tomorrow. I think it has gone well because I can do this at home. I don’t have to be at the gym to do it, which takes away a bit of the procrastination factor around it. But I also think that, for the first week, it is not a huge involvement in time needed either. It was less than 5 minutes each day, so not finding the time wasn’t an excuse. I want to keep up with this for the remaining days. I’m on day 14 and my lower back is kind of sore. I’m in good shape and do resistene training among playing sports. I’m curious to know how you did on this 30 day challenge. The numbers increase dramatically and there really isn’t very much rest. I’m actually looking for some feedback/reviews on this challenge to see if it’s actually beneficial to do the challenge or is it simply another random physical challenge with ridiculous work load that someone thought would be interesting to try. I got to day 15, and suddenly was crazy busy, so I have fallen off the wagon. I think that from day 12 and outwards it really goes beyond the quick workout it was in the beginning – and I felt much less motivated then. If it still had been the less than 5 minute thing it was in the beginning, I doubt it would have felt like so much stress to find the time. What I am going to do is going back to the schedule and seeing where I was when I didn’t feel like the workouts took too long and using those amounts of sit-ups, crunches, leg-ups and planks regularly in combination with cardio or other exercise. Maybe even on a 3-day exercise, one day rest concept… Because I did like that on this plan.